The Jungle Book — Alma Sana Inc. I stepped onto a bus at 9 ‘o clock in the evening, bundled in a North Face jacket, fleece sweater, and long johns to bear the Cusco cold. The overnight drive was suspenseful with dramatic twists and turns, and with only pitch-black windows at my side, there was no telling why. Eventually, my sleepy eyes fluttered open at the first feeling of light. Outside, all was yellow and green. I stepped off the bus into a toasty, heavy morning. Humid heat collapsed on my shirt, but I didn’t mind. After weeks of frigid Cornell and chilly Cusco, the sun and sweat rekindled my Californian soul. Motorbikes, not cars, zipped up and down graveled avenues, while fruit vendors were everywhere. In a matter of hours, I had left the high Andes and entered the jungle-land of South America. I was in a different world. 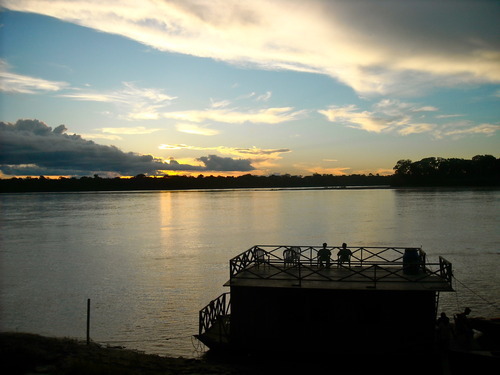 I, along with two other interns, had traveled away from urban Cusco to the southern Peruvian town of Puerto Maldonado, only 5 hours away from Brazil and surrounded by the Amazon rainforest. Our itinerary included 4 day-3 night expedition in the tropical wilderness. My ultimate expectation (and primary source of excitement) for the short trip was to see my favorite animal—the Capybara. 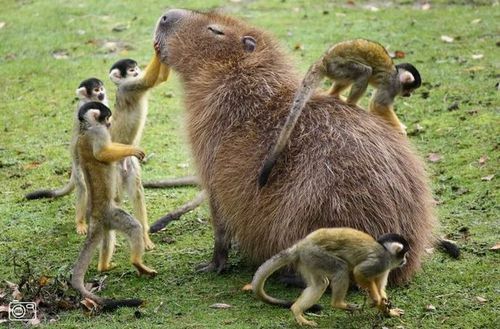 Infamously known as the world’s largest rodent, the cute guinea-pig/beaver mix dwells in the Amazon alongside anacondas (one of its predators) and Cayman alligators. Unfortunately, after spotting multiple species of monkeys, snakes, spiders, macaws, and countless other exotic birds, we had no luck seeing even one Capybara. According to our goofy tour guide, these elusive critters are the “masters of the grasses.” I will have to return to the selva (jungle) another time to see my prized mammal in the wild! Despite many relaxing (and nerve-racking) moments trekking through the jungle and skirting river water in a motorboat, I especially enjoyed hanging around the plaza of Puerto Maldonado. During the previous nights, while staying in a jungle cabin, there was only an outdoor orchestra of buzzing insects. Yesterday, however, I witnessed the Puerto plaza come to life. Wandering with a smile, I approached vendors in the plaza’s surrounding streets, watched families play soccer in the lawn, and felt Spanish rock tickle the atmosphere. Despite hints of poverty, the community was relishing in a Sunday evening of social festivity. There were no rushing buses, crowds of tourists, or hectic sidewalks—it was the simple life. Puerto teenagers mirrored those in the U.S. with short, trick bikes and skater clothing, while toddlers took photos with makeshift mascots, and dogs walked on leashes beside caring owners. Meats and popcorns sizzled, permeating all the senses. I had missed Fourth of July in the jungle days before, but this scene reminded me of a summer night found in North America. When the sun had finally settled, and electric lights glowed in the Amazonian twilight, I shivered with warm satisfaction. Newer:Reflection Older:I'm On Top of the World, 'Ay!